A typical dustmask in use. If you work in certain environments or perform certain activities, workers can become exposed to harmful particles that are present the air; such as dust, mist, vapour, gas or even fumes. To overcome this, ensure you outfit yourself with the correct RPE. 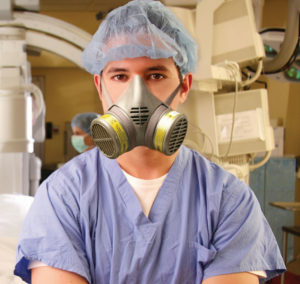 RPE is the general term that describes all dust masks and respirators. It stands for “Respiratory Protective Equipment”. Dust masks – Dust masks come in three basic levels of protection, FFP1, FFP2, FFP3 with valved and un-valved styles. They are ideal for a number of roles, with the lower levels of protection ideal for particulates such as wood and cement dust. For more hazardous particles such as asbestos, a level 3 dust mask would be advised. Dust masks are a “single shift” product, that means they have a life of around 8 hours, potentially less. The different levels will reduce the amount of particles breathed in by factors of 4, 10 and 20 respectively. Dust masks, as the name suggests – are only really suitable for “hard” particles, vapour and gasses will seep through and cause irritation. Half and full face respirator masks – Unlike dust masks, respirators are intended for extended use. When maintained correctly, they will offer many years of effective usage. This type of RPE is far more adaptable than the dust masks, as they come in single or double filter styles. They attach with a bayonet connection, and there are a number of different filters which can be attached to provide protection against a wide range of hazards. Below is a simple guide to the types of protection common filters give . They are universally colour coded for ease of use. See our excellent range of Respirators and accessories online in our store now.